The Thanksgiving weekend had passed by with it's gorgeous summer like weather (I had to work) but the 3 day forecast for Thursday to Saturday following was for reasonable weather. It looked like cool with sunny periods and only a small chance of a shower. I quickly decided to book Thursday/Friday off and to do a quick loop in the Kukagami Lake area northeast of Sudbury. A firend had cleared some portages along part of a route from Kukagami Lake out through Carafel Lake to Maskinonge Lake, so I decided I head out that way and then loop back through a a couple potholes, Potvin and Donald Lakes. Left the house at about 9:00 and headed to Sportsman's Lodge on Kukagami Lake. Arrived about 10:00 and after quickly checking to ensure I could call Jan (2 pay phones available - 1outside/1 inside) I loaded the canoe was on my way by 10:30. Its mid week after the holiday weekend and the lake is quiet. I see only a few folks along the way, most likely some of the permanent residents on the lake. Weather is cool, partly overcast and the wind is about 15 km/hr out of the northwest - all in all a good day for canoeing! I head north on Kukagami and soon turn east down Outlet Bay heading for the first portage into Carafel Creek. The port is easy to find and leads to a small pond at the bottom of the rapid where the sun appears and I sit and eat my lunch. A quick paddle across the pond and I'm at the second portage. I pass through two more ports bypassing small falls and rapids before entering Carafel Lake. The creek is a winding swampy section from the last port to the lake and I scare up several flocks of ducks along the way. As I enter the lake a boat passes by heading to the south end of the lake - most likely a group of hunters. Carafel Lake is situated north/south and of course I'm headed north and into the wind again! There is a beaver dam across the outlet from the lake but its only a couple feet high and an easy lift over. The creek continues to wind its way through some swampy areas on its way to Maskinonge Lake. 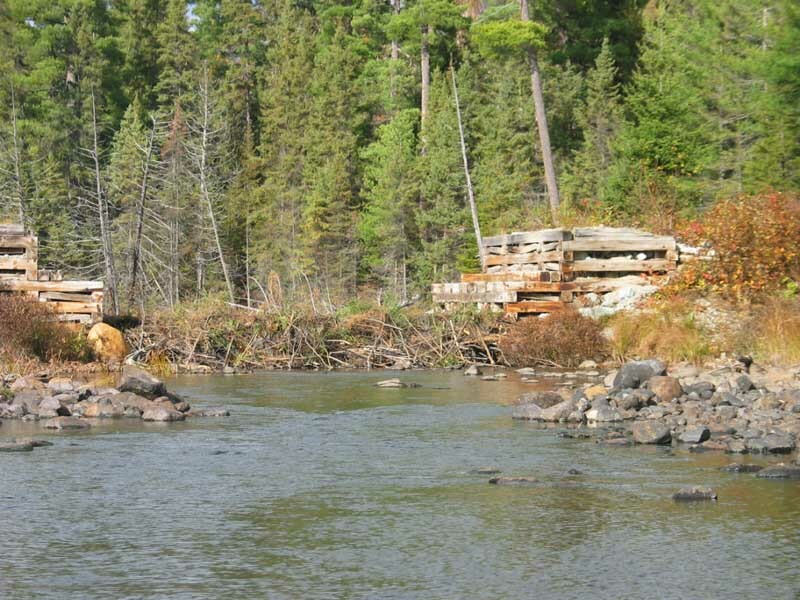 There is a set of bridge abutments with the bridge removed after the logging operation in the area and beavers have dammed the creek here. This is an ambitious affair and is a good 6' high. I again encounter another small beaver dam about 100 metres shy of Maskinonge Lake. After lifting over this dam, it is readily apparent that the lake has been drawn down through the dams in the area as the water levels look to be about 5.5' lower than the high water marks. Its loew enough that I can't float the last section of creek and have to portage across the boulder field to the lake. Maskinonge is part of the Chiniguichi River system and water levels tend to fluctuate depending on the time of year and demands for the water throughout the system. I head north (into the wind!) as I'm headed for an island campsite about 3+ km up the lake. I reach camp about 4:00 pm as the skies clear off and set up for the evening. I sit facing the west with a book and a tea in the warm sun till it's time to make supper. I cook and clean up by 6:00 pm in anticipation of it being dark by 7:15 - 7:30. I sit around a small fire and watch an almost full moon rise over the lake in the clear crisp evening. The moon is bright and the stars put on a good show but I retire around 9:30 to the tent and a good book. Distance Traveled - 18.5 km Distanced portaged - 800 m.
It's a cool damp morning to wake up to and the lake is totally fogged in and the temperture hovers around -2 C. The fly on the tent is covered in frozen water droplets from the fog. As I was in no great hurry on this trip, I rolled over and stayed warm in my sleeping bag till 8:00 am. The fog was still thick when I arose and while I ate breakfast and packed up it started to dissipate and some sun and blue sky poked through. I was loaded and on the water by 9:30 heading north through some patchy fog conditions.. However no winds this morning and the sun continued to burn the fog patches off. It was a beautifully calm morning and the moon was still setting over the sunlit shoreline. It was about an hours paddle to the portage that leaves Maskinonge and takes the route west again through a series of ponds and lakes to Donald lake. The route is a favourite of the camp in the area and they keep it maintained. The first port is short (140 m) to a pond but I carried around the pond ias it was quite low, add the 2nd port (320 M) for a total of approx 900 metres. The put in is just past an old rock and timber dam that is a remnant of the old logging drives in the area. The port actually passes through the dam in a section that has been cleared of rock. A quick paddle brings you to a short portage around a pretty little falls. Another 10 minutes brings you to another short portage along a rocky creek bed into Potvin Lake. Here the skies start to cloud over, the temperature dropped and of course the wind came up and I had to paddle into it! 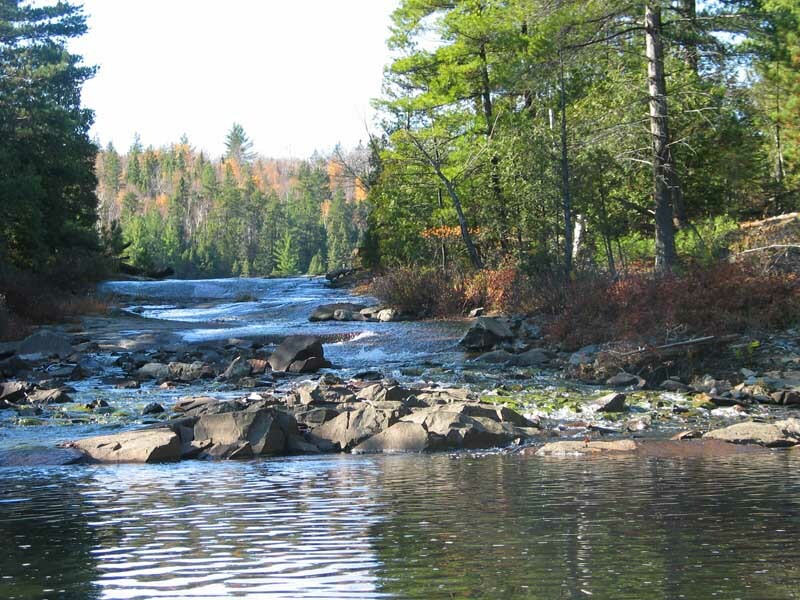 The west end of Potvin Lake presents a waterfall and rapids to portage around about 180 metres on the right. It was another 10 minutes up the creek to the short portage into Donald Lake. This is one of my favourite lakes and several nice campsites, particularily at the north end of the lake. As it's still early afternoon, I decide to push on and do the last portage of the trip back into Kukagami Lake. It's about a 1000 metres but it is a well used and maintained portage. Once on Kukagami I head for a campsite and the skies opened up for a quick 3 minute shower! The sun quickly reappeared and I dried out quickly. Once at the campsite I hung the tent and tarp to dry since it was packed wet but the sun and wind dried everything quickly. After supper I enjoyed a fire, the stars till I headed to the tent and my book. Another cool night but without the heavy fog of the previous morning. There is a covering of frost on everything though, as the temperature was -4C. I stayed abed till 8:00 again before getting up for breakfast and tea. It was another beautiful day with no wind and clear sunny skies. I had aliesurely breakfast and was packed and on the water at 10:30. 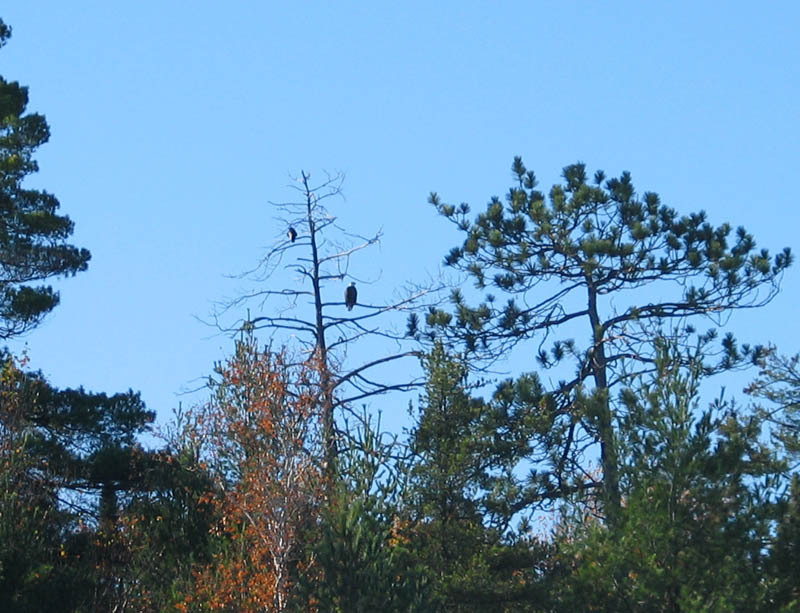 As I rounded the point to head south I spotted a Bald Eagle sitting in a snag. Kuakagami Lake has 2 distinct parts - the northern basin is the undeveloped portion of the lake and is separated from the developed southern basin by a 1 km long narrows. I was in no hurry and slowly paddled along the shoreline past some of the cottages and such. I had lunch in a sheletered bay of an island and arrived back the Sportsman's Lodge around 12:30. I carried my kit and canoe up to the lodge office area and went in and phoned Jan for pickup. While I waited, I sat in the dining area warming myself in front of the wood stove and enjoyed a beer and some conversation with George, the lodge owner. The Sportsman's Lodge offers canoe outfitting, trip planning assistance, shuttle services and secure parking for canoeists in the area. It sure is nice to finish a trip at the lodge with a cold beer!